Prom 16 saw the BBC Scottish Symphony Orchestra, with guest conductor Ilan Volkov, exploring human drama across four programmatic pieces. Liszt was compared and contrasted to Mussorgky; and a new piano concerto by Julian Anderson was premiered. With melodramatic highs, melancholic woes, and thrills in between, this was a night for awe and wonder. Liszt’s symphonic poems is a series of thirteen works that established the genre. Hamlet set the stage for tonight’s theme, perfectly encapsulating the character’s tortured soul. The orchestra writhed and seethed in tortured indecisiveness, punctuated by waves of frustrated anger. Volkov kept a steady hand on his musicians throughout, maintaining a tautness punctuated by select outbursts. Unlike the play, however, Liszt’s Hamlet never seems to find his inner resolve. From the Cradle to the Grave, followed later in the evening and likewise demonstrated Volkov’s mastery of the material. It is a strange, austere piece – The Telegraph’s Ivan Hewett incisively describes as a “bleached-out quietness, almost expressionless apart from a pallid angelic tenderness”. Not for a lack of polished performances on the SSO’s part, I remain undecided on these emotive, but seemingly incomplete pieces. 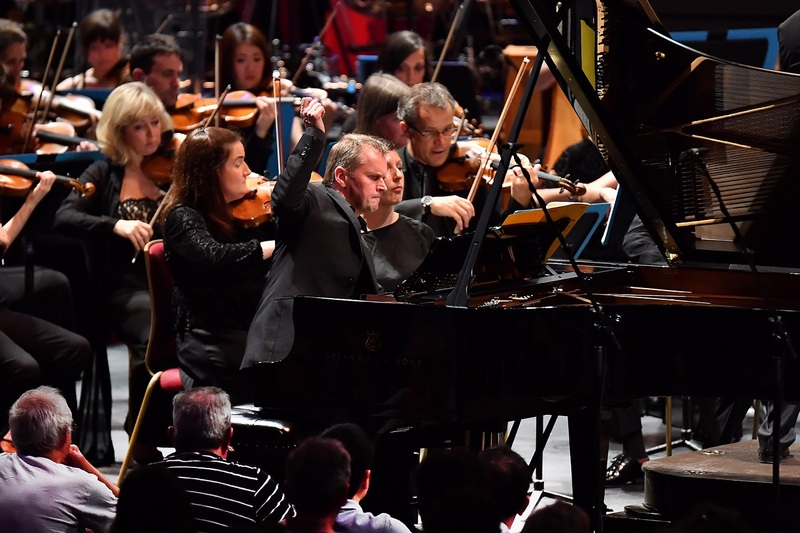 Julian Anderson’s piano concerto The Imaginary Museum was commissioned by the BBC, with the Bergen Philharmonic Orchestra and Sydney Symphony Orchestra. For this world premiere, the orchestra was joined by guest pianist Steven Osborne. The piece began strangely, with fits and starts from the piano. Osborne executes a little flourish on each phrase, one hand flying off from the keys, with an almost insouciant manner. It was entirely in-keeping with the kaleidoscopic edifice emerging behind him. The orchestra flurried about, introducing seemingly discordant tones at odd times. Yet it all coalesces into a beautiful jumble, a narrative of haphazardness. We found ourselves dashing around a bizarre, Victorian collection of curios and antiquities. A glockenspiel here, a rain-stick there – and even a brief shake of the maracas – interjects upon this merrily colliding soundscape, to good effect. Yet others – chiefly the harp and the keyboard – seemed to disappear into this soundscape of curios. Meanwhile Osborne’s performance became ever more intricate, his playing more effortless and scintillating. In the end, Anderson brings together all those rambling, idiosyncratic sounds into a joyful, tumbling dance. This charming, truly imaginative piece was worth the ticket price alone. Pictures at An Exhibition (orch. Ravel) was tonight’s finale, and I got the impression that Volkov and the orchestra had released their pent-up energies for it. Each movement, framed by the grand and golden promenades, was vividly, and uniquely, brought to life. The Old Castle, with Ravel’s inspired alto saxophone solo, was the most romantic portrait of medieval society and its religiousness. Even the Catacombs, thanks to a brisk pace and stirring musicianship, was awesome with its weird, ethereal vitality. Volkov never let the delightful Tuileries get too bouncy and fatuous; on the other hand, The Hut on Hen’s Legs (Baba Yaga) truly seemed to scamper away on a fantastical life of its own. In these movements, the orchestra’s powerful brass section shone. The epic finale of The Bogatyr Gates, for which a percussive metal pillar was wheeled out, was the summit of both Mussorgsky and the orchestra’s talents. I suspect that this performance, in particular, was sensitive to the Royal Albert Hall’s vastness and its varying acoustics. For me, at least, it was a foray into new and wholly unfamiliar music. I found excitement and antiquarian wonder in Julian Anderson’s The Imaginary Museum. In Liszt, less so – although it may simply be that I do not like the lie of the land. Mussorgsky’s music, and the performance of it, fully lived up to my expectations and more. More information (and BBC Radio 3’s recording) available here.